The chairman of a surf club says someone could be killed unless powered watercraft are banned from being used near the shore. 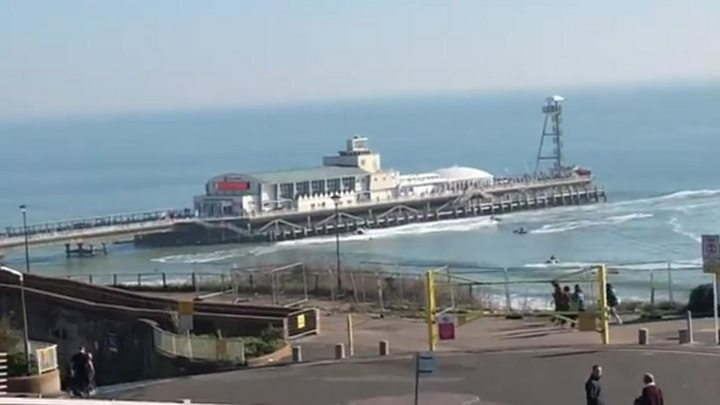 It comes after riders were filmed circling surfers and paddle boarders on Sunday near Bournemouth pier. Gary Elford, chairman of Wessex Surf Club, described the incident as like a "gang fight". Bournemouth Borough Council said it was working with the Dorset Police Marine unit to stop it happening again. Mr Elford said the scene near the pier the incident was the most dangerous he had witnessed. He said: "There was about 11 or 12 jet skiers out by the pier - with two to four of them you can't describe it as anything but malice. "At one stage I would say they were no more that 10ft away from the surfers. "They race along the shoreline, if someone is swimming it would kill them. There have been too many incidents now for it to be ignored." The surf club is calling for a specific area for powered watercraft to be established. Local bylaws state personal watercraft must not "endanger other beach users" if they are within 200m of the low water mark, but the regulations only apply between April and October. A council spokesman said: "We were made aware of the concerns over the weekend. Dorset Police said it was investigating but added there were limits to the action officers could take unless someone was injured. The Royal Yachting Association, which runs proficiency courses for riders, said the craft needed to be "handled with care and responsibility". Chief power instructor Rachel Andrews said: "We are urging all those involved to act responsibly, respect other water users and report those that have disregard for others enjoying the water."